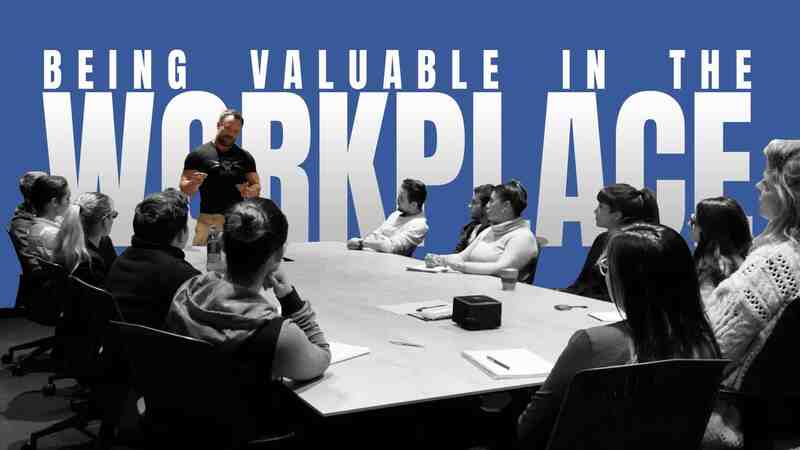 You’re highly valuable in the workplace when you’re adding value to the workplace, so much value, it’s desirable that you can duplicate yourself by teaching others, and perhaps move on to other roles in the organisation. If you become irreplaceable in a workplace you become a liability because you can become a key person of risk. I hate it in my organisation if anyone becomes irreplaceable or has too much power because if you lose them, you’re f***ed! The real value is not in becoming irreplaceable, the real value is finding the right organisation that sees the value in your ability to be able to duplicate yourself and move into the next role. A lot of people think, “I’ll become irreplaceable and they’ll always need me”. That’s called co-dependence, it’s not a healthy form of connection or commerce. Finding the right organisation that sees the value in duplicating you is key here. Right now we’ve got this massive risk in our business where we’ve got a couple of really key sales people, one in particular. The challenge comes if there’s resistance to them duplicating themselves because maybe they feel they’ll lose leverage, or maybe they’ll feel that they’ll lose their ‘best performer’ status. This can become a liability for the business because as the business owner you have to recognise the risk here and mitigate it somehow. Many businesses have this issue, especially in sales. So you have to look at ways to build up the people around them to mitigate the risk. If you become irreplaceable and you’re toxic you become a nightmare for a business. I suggest to business owners if they have a team member that is both irreplaceable and toxic – get rid of them immediately. The toxicity will cost you a lot more in consequences of damaged culture than what that person brings in from their role. You might be thinking but they bring in this much revenue, but you’ve got to understand the consequence of the energy and destructive behaviours on the culture. I hope this is taken with good measure, of equal parts sugar and salt. By becoming irreplaceable in a business to me is broken psychology because it’s coming from a place of lack not a place of abundance. The perception that if you become irreplaceable you’ll be able to demand more or get more money in some cases may be true. But you’ve got to understand the long term consequences is, if anyone in this organisation becomes irreplaceable they become a key person of risk and thereby I look to mitigate it. And the mitigation might be through replacement. So if they become a risk there’s got to be an exit strategy, even if it takes one, two or three years to replace them. There’s got to be a plan B because if we’re dependent on someone and that person leaves, then all of a sudden the business can go to sh*t.
That means all the employees lose their jobs, all the customers don’t get serviced anymore and that is a risk that is unacceptable for any business. So my advice is, rather than becoming irreplaceable in a business find a way to add so much value, in so many different ways, that people won’t want to get rid of you. Do it from a place of abundance where you learn how to grow into different roles, where you can replace yourself, or duplicate yourself so you can add even more value. Imagine if you’re a cracking sales person, yes you’ll be worth a lot of money. But imagine if you could duplicate that into 12 different people, imagine how valuable you’d be then. If you’re thinking, “Well, they could get rid of me and they’ve got those 11 other people”. That’s a lack mentality and is codependency, where you want someone to become dependent and addicted to you. That’s not a healthy relationship, there’s no choice in that, it’s unhealthy. Just add value in such an integral and ethical way that people would never want to get rid of you because they don’t want to. Imagine being in a relationship where you fundamentally need that person, you can’t leave because you need that person, what kind of an energy and environment would that create? You’re not there because you want to be there, you’re there because you’re addicted to some kind of chemical response or stimulus because you need to be there. Versus, imagine being in a relationship because you want to be there and knowing that the person that you’re with is there because they want to be there. That is a completely different form of a relationship.